Perfect quality for a reasonable price. All the pads have R90 homologation from TUV Germany or Idiada. Brakes are one of the most important elements in every vehicle. Since an engine failure will, at most, stop our car, failure of brakes can be a threat to our life. Our offer includes parts for passenger cars, utility vehicles and trucks. We manufacture brake blocks, disks, shoes and linings. We constantly extend our offer in order to fully meet market requirements. Operating in the automotive industry (especially in relation to passenger cars) is a constant development, extending portfolio by parts to further vehicle models. 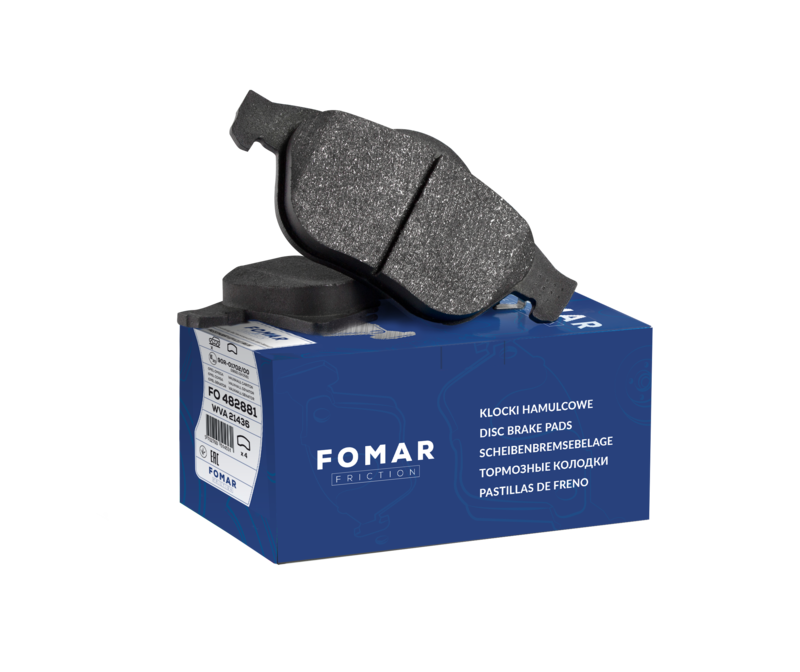 Since several years ago the situation was relatively simple, today, various types of brake blocks and disks can match one type of a vehicle. It is unlike the markets of linings or elements for utility vehicles and trucks, in which a range of products is highly limited. We constantly develop our products in order to guarantee an optimum compromise between braking force and driving comfort. All blocks for passenger cars are equipped with anti-screech layer and, if required, pushers and wear sensors. Friction pads from brake shoes are manufactured with the use of a modern rolling method. Friction linings for utility vehicles are made on request without holes and are supplied along with rivets. Our laboratory is constantly modernized and raw materials delivered by certified suppliers are constantly controlled. 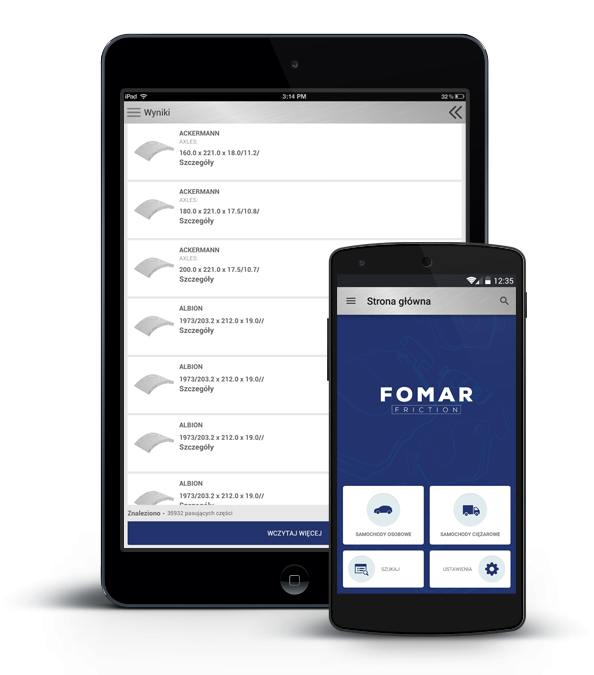 In order to facilitate picking an appropriate product, we provide catalogues in a paper and on-line version in a form of an applicable application which consists of all the elements in our offer. Everyone can easily find an element, e.g. blocks, which the manufacturer recommends to use in the vehicle. Feel welcome to make use of our catalogues in the form of an online search engine, and as an application to be downloaded and installed on computers with Windows. 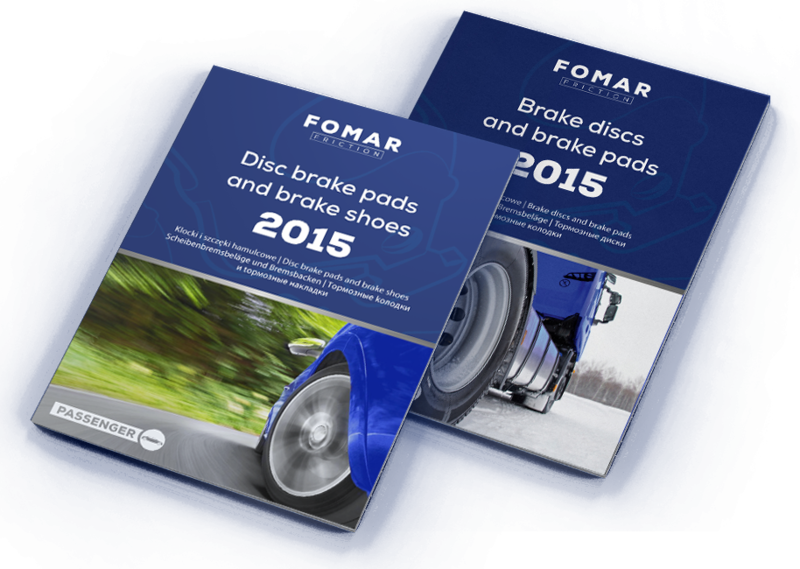 Collect the Fomar catalogues with our brake pads and shoes for cars, as well as pads and discs for trucks, in the PDF format. Clients from all over the world have trusted us – we sell to over 30 countries in 3 continents.